New Dawn Fades is a play about four young men who decide to form a music group; it is a play about a city re-discovering an identity; it is a play about a descent into mental illness during ever growing success; it is a play about a very particular period of time. The so called â€˜Punk revolutionâ€™ covered a remarkably short period (by most estimates around two years) but it inspired a host of new genres which seemed to capture the mood of a generation and the times in which they lived. Joy Division emerged as one of the most influential groups of that time and through their metamorphosis into New Order, also one of the most enduring. 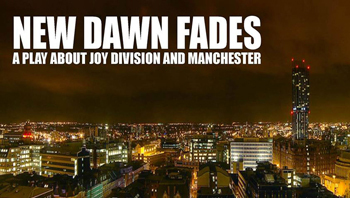 New Dawn Fades is a tribute to Joy Division, but it also an exploration of the group members and the people most closely associated with them. In one sense, it is a story which could be told about any bunch of young men who decided to form a group even though none could play an instrument but there are a few factors which set the Joy Division story apart. The ascent of the band mirrored that of Manchester as a vibrant creative force. This is years before â€˜Madchesterâ€™ became a buzzword and New Dawn Fades shows people having the vision back in the late 70â€™s for what Manchester is today. At the same time, the 70â€™s was a time of great unrest as Britain struggled to come to terms with being a post-colonial, post-industrial power house and this mood is very much present in the play. There are some excellent renditions of Joy Division classics which still remain haunting and vibrant. New Dawn Fades is a well-thought out presentation, using multi-media sparingly, whilst creating some very vivid images of the backdrop to the story. The lighting is also used to good effect, particularly in bringing over the inner angst of Ian Curtis as his epilepsy worsens. There is enough live music to bring over what the band was all about without detracting from the character observations and conflicts at the centre of the piece. The use of Tony Wilson (Mr Manchester) is a superb device through whom tell the story, brilliantly played by Alan Donohoe, with both charisma and feeling. There is real chemistry between the band members; the brooding Peter Hook, menacingly played by Bill Brashaw, Stephen Morris played sensitively by Matthew Melbourne and Nathaniel McCartney as self-assured guitarist Bernard Sumner. The anguished torment of Ian Curtis is brought stunningly to life by Joseph Walsh, as the tragic lead singer is seen to steadily disintegrate. There is a well observed balance in the hard-driving manager Rob Gretton played with grit by Giles Bastow and Ianâ€™s long suffering wife Deborah Curtis, played with real passion by Leah Gray. Credit must also be given to Emma Bird's creative directing, and Sean Mason whose varied range of minor roles included Frederich Engels and John Dee as well contemporary figures. New Dawn Fades is a superb testament to a local success story but it will mean lot more to different groups of people. For some, old enough to remember the period, it will bring back floods of memories and perhaps pause for reflection. For younger people, New Dawn Fades serves to bring over not just the story of a band in the ascendency but the attitudes and backdrop of a troubled time. New Dawn Fades is also highly relevant at a time of growing awareness of mental illness; would Ian Curtiss have still killed himself had he been young today? It is an open question. New Dawn Fades is a superb production, told with feeling, passion and humour which will leave the audience thinking about the story and side issues long after leaving the theatre.